These days, our lives are largely dependent on technology and electronics. In 2015, about 87% of American households had at least one computer at home and 75% had at least one handheld device, such as a cell phone or tablet. In many cases, you will find multiple cell phones and computers in one household. What happens to all of those electronic devices when we are done with them? There are many ways you can get rid of old tech without sending it to a landfill. This is important because laptops, cell phones, tablets and other electronics can contain valuable resources. They may also contain components that are harmful to the environment. Here are three ways you can ditch your old tech with minimal impact on the environment. 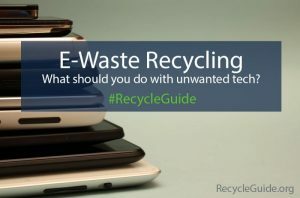 In almost every case, reusing an item is better than recycling it and old computers and cell phones are no exception. We often upgrade our phones every couple of years, but that doesn’t mean the old one is useless. And while you may update your computer after a few years, the average lifespan of a computer is actually seven to eight years. Your old laptop may still be perfectly usable for someone else. There are many nonprofit organizations that will happily accept your old tech. World Computer Exchange and Computers with Causes accept computers, monitors, tablets, accessories and assorted tech gadgets. Cell Phones for Soldiers collects old cell phones, refurbishes them for resale and uses the profits to purchase phone cards for service members to call home while on deployment. Before donating any device, we encourage your to delete all personal information. If you can, wipe the device or resort factory default settings. This will help ensure your personal information is safe. It is also best to make sure you only donate your old tech to reputable organizations. Just like a scrap yard for cars, old computers can be used for their parts. Salvaging parts for reuse in a new computer saves resources and can also save you money. Depending on your skill set and the age of your device, your broken computer could have numerous parts worth salvaging. Looking for a fun project? Instructables offers some creative (and crazy) ideas to reuse your computer parts. There are all kinds of fun ways to reuse keys from old keyboards. If you are the DIY type, computers have a variety of components you can use to power up or redecorate your next project. If your tech isn’t suitable for reuse or repurposing, then recycling is the way to go. In addition to saving the environment, you can save some green. Some companies, like Best Buy, will accept your old electronics for recycling and offer discounts in return. We may occasionally detach and unplug, but we are largely tied to our cellphones and computers. With so many electronics in our homes and offices, disposal can easily become a big problem. Preventing irresponsible or unlawful dumping of electronics, especially with such large quantities, is essential to avoiding contamination. E-waste can contain mercury and lead. The toner in cartridges for printers and copiers is classified as a 2B carcinogen. Irresponsible disposal of e-waste can lead to harmful levels of polycyclic aromatic hydrocarbons, hexabromocyclododecanes, polychlorinated and polybrominated biphenyls and other dangerous contaminants. All of these compounds can pose serious risks to our health and the environment. Whether your recycle your electronics or choose to throw them out, be sure you are doing so responsible. Work with reputable companies and services. Follow all local and federal guidelines or choose a company that adheres to or exceeds these regulations. It may take a little time and research, but smart disposal choices have a huge impact on the environment, especially with electronics such as cell phones, laptops, monitor and tablets. The post E-Waste: Recycling Old Tech appeared first on Recycle Guide.